The health of an individual depends on his nutrition. It is this well-known fact that has led man to be more aware of the food he consumes. A large number of diseases are known to be diet related. A certain diet may itself be the cause of disease or alter the course of a known disorder such as diabetes or kidney disease. The food consumed by any individual or a community is determined by a number of factors viz. socio-economic status, religion, food availability and family traditions. Medical factors like food allergy, intolerance, diabetes and heart disease sometimes force a change in diet. Diet patterns may be classified broadly as vegetarian or nonvegetarian. Vegetarians can be further classified, depending on the food consumed, into fruitarians, vegans, lacto-vegetarians and lacto-ovo-vegetarians. The term vegetarian is generally used to refer to the lactovegetarian. The basic difference between the vegetarian and the non-vegetarian diet is the exclusion or inclusion of eggs, fish, meat and poultry. The difference in the nutritive value of the diets is dependent on the nutritive value of these foods. In general, the foods considered as non-vegetarian are high in protein and fat, low in fibre and are poor sources of carbohydrates, whereas vegetarian foods are rich in fibre, carbohydrate, vitamins, minerals and can be adequate in fat and protein as well. These differences in the nutritive value have given rise to the question - which diet is superior? All foods of animal origin are said to contain proteins of high biological value, viz. proteins that may be better utilized by the body. Proteins consist of amino acids, some of which can be synthetized by the body while some cannot. Amino acids that are not synthesized by the body are referred to as essential amino acids. Non-vegetarian foods contain all the essential amino acids unlike any single vegetarian protein source(except milk). However, all the essential amino acids can easily be obtained in a vegetarian meal by the judicious combinations of various foods. That a vegetarian diet is deficient in vitamin B12 is another bone of contention. Though most sources of vegetarian food are low in their vitamin B12 content, there are never any manifest deficiencies of this vitamin even in strict vegans. It is therefore likely that vitamin B12 is required in very minute quantities. Hence B12 cannot be the justification for resorting to foods of animal origin. It is widely believed that a vegetarian diet cannot provide adequate calories, but it is untrue. Balanced vegetarian diet can give adequate calories quite easily. Carbohydrates (energy) e.g. rice, sugar, honey etc. Protein (building blocks) e.g. eggs, meat, fish, pulses, milk, nuts etc. Vitamins and minerals e.g. fruits and vegetables. The main difference in the vegetarian and the non-vegetarian foods is the quantity and quality of proteins available in both. The non-vegetarian food is said to be rich in proteins but as mentioned earlier, vegetarian sources can supply the same if judiciously combined. Hence when a vegetarian seeks protein he has to focus his attention on pulses, nuts and milk. Pulses, the seeds of the leguminosae family are the main source of protein in a vegetarian diet. The major portion of the pulse cultivated is consumed after being dehusked and decorticated. This process not only shortens cooking time but also makes them more easily digestible. Whole pulses are best consumed after being soaked and sprouted. These sprouts have a high dietary fibre. Being live foods, they have the capacity and potential to create and generate new life. Seeds, grains, beans and even nuts can be sprouted. Sprouted food is easily accepted, digested and assimilated. Sprouting also gives a tremendous boost to the vitamin and enzyme content. In fact, in growing children, where extra proteins and vitamins are needed, lightly steamed sprouts are the best choice of food. A biogenic diet includes fruits, fresh vegetables, whole grains, nuts, beans and seeds which contain life-generating and cell renewal capacities for youth and life. Sprouts (see fig. alongside) are living plant life, easily digested and invigorating in their effects. This group supplies 350 cats/ 100 gms and has a protein content of 20 % with the exception of soyabean (40%). To ensure the best utilization of this protein the first criterion is to meet the energy requirement. If the diet is deficient in calories the protein is used to make up this deficiency. Proteins are made up of units called amino acids. The quality of a protein is dependent on the amount of essential amino acids available from it. A protein that has all the essential amino acids in the desirable amount is said to be of the best quality. Non-vegetarian sources of protein are complete in their amino acid contents whereas vegetarian sources of protein are not as complete. However, the combination of two food substances more than makes up for individual deficiencies e.g. pulses are deficient in sulphur containing aminoacids whereas cereals are rich in sulphur containing amino acids. This makes a cerealpulse combination a complete source of protein. Hence it is a mistaken belief that non-vegetarian food is essential to provide adequate proteins for growth and development. Looking into any of the traditional vegetarian meals of India we see that this is a practice that has been followed since ages. Not only is every meal a cereal-pulse combination, but in most cases, is accompanied by a complete protein source (milk or any of its products). The traditional idli-sambar, varan-bhat, thepla-dahi are some of the many examples of cereal-pulse, cereal-milk combinations. Pulses have a carbohydrate content of 60%, most of which is in a complex form. Certain oligosaccharides present in pulses escape digestion and are responsible for flatulence in a few susceptible individuals. Common home processing methods like sprouting and germinating decrease the amount of flatulence producing oligosaccharides. Garlic is a bacteriostatic agent and aids in decreasing flatulence. The fat present in pulses has a higher polyunsaturated fatty acid content (1.5%). This makes pulses not only qualitatively but also quantitatively better than meat. The minerals present in pulses are calcium, phosphorus, magnesium, sodium, potassium and iron. Of the phosphorus present, 80% is bound to phytate and is biologically unavailable. Soaking of pulses in water before preparation decreases some of the bound phytate, thus increasing the amount of available minerals. The thiamine and carotene content of pulses is similar to that of cereals. Pulses are rich in niacin but devoid of vitamin C and poor in riboflavin. Once sprouted, pulses are excellent source of vitamin A, B complex, C, D and K.
Sprouting dramatically increases the vitamin C content of the food. The vitamin E content of sprouted wheat increases 300% in four days. So much so, that because of the excess of vitamin E content, sprouted food administrated to patients of submucosal fibrosis of the mouth over two to three years, halts the progress of the disease and in some cases can cause actual regression. The vitamin C content also increases 600%. There is more carotene in sprouted wheat than in a carrot. The edible pulses contain two thermolabile factors that have been implicated in toxic effects. They are the trypsin inhibitors and haemagglutinins. The trypsin inhibitors suppress the release of amino acids making it unavailable and may also stimulate extra production of trypsin which leads to a loss of pancreatic activity. Sprouting of legumes causes a loss of this inhibitor and, if still present, it is then more susceptible to destruction by heat. Haemagglutinin present in pulses may combine with haem and result in destruction of haemoglobin. This constituent of pulse is generally not absorbed and is destroyed by cooking. Fermentation and sprouting help to speed up this destruction. Maximum utilization of pulses is thus obtained if the diet is adequate in calories and the whole pulses are soaked and sprouted prior to cooking. Soda, often added to pulses while cooking, decreases cooking time but also decreases the nutrients and is therefore best avoided. The main protein of milk is casein (80%), the rest is lactalbumin and lactaglobulin which are the whey proteins. Most of the casein is bound to calcium. Casein is easily coagulated by acid or by enzyme renin while the other proteins are not. The milk protein contains all the essential amino acids and has a high digestibility co-efficient (97 - 98%). Milk fat is also called butter fat and is characterised by the presence of short chain saturated fatty acids. 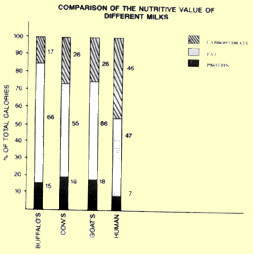 The fat content of milk is variable (3 - 5%) and is present as an emulsion making it easily digestible. Lactose is the carbohydrate in milk which is broken down by the enzyme lactase. An absence or insufficiency of lactase causes micro-organisms to act on lactose leading to the formation of gases and thus the cramping discomfort and diarrhoea in 'lactose intolerence'. The lactose content of the milk can be decreased by fermenting milk to form yogurt (curd) where the amount of lactic acid is higher. The lactose content of milk is 5%. The minerals present in milk are sodium, phosphorus, sulphur, magnesium, manganese, calcium and iron. Calcium is bound to phosphate which, with casein, forms a phosphoprotein. It is also present with fat. The quantity of iron is low in milk, but is of an excellent quality resulting in its ready absorption. Vitamin A - carotene present gives the milk yellowish tinge and is obtained from plant feed. The amount varies with the breed, the amount present in the feed and the fat content of milk. Vitamin D, E & K - These nutrients are present in small amounts. As they are fat soluble, they are associated with the fat content of the milk. The skimmed milk has an even smaller amount of these vitamins. Thiamine - This nutrient is also dependent on the amount present in the feed but it is also synthetized by the lumen of the gut of the cow and is therefore present in fair amounts in cow's milk. Riboflavin - The colour of the whey is due to the presence of this nutrient. It is present in very small amount (0.05 -0.1%) and is dependent on the amount present in the feed. Niacin - Milk is a good source of tryptophane which is a precursor of niacin. Vitamin C - This vitamin is easily destroyed by application of heat and exposure to air. The small amount present in the milk is destroyed during pasteurisation. Milk is a food that is highly perishable. Thus processing it will help to store it. Spray drying of the milk to powder or condensing it are some examples. Processing, in most cases, involves high temperatures and this destroys some of the nutritive value. This loss can be overcome by fortification. There are a number of dairy products and these may be classified into 'fermented' & 'unfermented'. The most common in India is dahi (curd). This has a better nutritive value, not due to an increase in nutrients but an increase in digestibility. Fermentation increases the vitamin content and lactose is converted to lactic acid. The calcium and phosphorus of curd are more easily assimilated. Nuts, which are the seeds of fruits, contain nutrients to aid in the growth of a new plant. This is why all nuts are not only a good source of nutrients quantitatively but also qualitatively. Nuts are classified, depending on their nutrient content (protein, fats and carbohydrates). The nuts with a high fat content, in most cases, are also high in protein, and this group includes most of the nuts. Those high in carbohydrate are few e.g. chestnut. On an average, nuts are found to contain 50% of fat and 25% of protein. Nuts are a rich source of essential fatty acids. This group of food thus supplies not only calories but also, weight for weight, twice as much protein as any other food crop (fig.2). Nuts are a good source of vitamin B complex in particular. Groundnuts are rich in thiamine and nicotinic acid. They have a mineral content of 2%, a large fraction of it being phosphorus and potassium. The most common complaint regarding nuts is indigestion. This, in a majority of the cases, is due to over-indulgence and poor mastication, both of which we can easily rectify. In order to get the maximum utilization, nuts must be consumed in limited amount. Nuts may also be soaked overnight. Humidity and unhygienic storage conditions cause food to get easily contaminated with fungi. Groundnuts are prone to such infestation which produces aflatoxin. This toxin causes damage to the liver and can be avoided by proper storage. Nuts are consumed in various forms. They may be had fresh, dried, dehydrated or roasted. Nuts are used for oil extraction. The meal left after the extraction of oil from nuts is rich in protein. Nuts are most often considered to be expensive and out of the common man's reach. Comparing the cost of almonds and cashewnuts per kg with that of eggs and meat, the cost of 10 gms of protein is similar, if not less, in the case of nuts. Coconuts are botanically stone fruits and not nuts as they are termed. This stone fruit is largely used for oil extraction and it is thus classified as an oilseed. This fruit is consumed at different stages of maturity and its nutritive value varies accordingly. Tender Coconut: The most tender coconut contains only a liquid in it and no kernel meal. The tender coconut water is a common food in the sick room and this drink has the advantage of being sterile. This drink is a good source of electrolytes. As this- fruit matures the amount of water decreases and the amount of meal increases. The thin initial layer of meal has a high percentage of water and so is not a dense source of nutrients, this is one of the reasons that makes it an easily digestible food. Ripe Coconut: The thick layer of kernel is much lower in moisture and high in calories. The coconut kernel is high in oil content and is used for oil extraction. The coconut oil has a high percentage of medium chain triglycerides (M.C.T.). This M.C.T. is of great therapeutic value when other forms of fat are not tolerated. Another byproduct is the coconut milk which is obtained from the endosperm. This is grated, ground and squeezed to expel milk. The endosperm on grating can be air dried to reduce its moisture content to less than 2% to obtain the dessicated coconut. This is commonly used for the preparation of sweets and biscuits. Dry Coconut: This is the coconut at its maximum degree of maturity and thus with the lowest percentage of moisture. At this stage the coconut has only 4.3% of moisture as compared to the tender coconut that has 90.8%. This is also the most concentrated form of nutrients. It supplies 6.8 gms of proteins and 62.3 gms of fat per 100 gms. The above discussion on the nutritive value of pulses, nuts, milk and coconut makes it clear that the nutrients supplied by a non-vegetarian diet can be obtained from a vegetarian meal. All this calls for is an intelligent combination of the foods permitted. 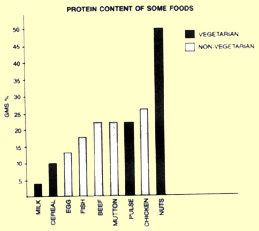 The vegetarian sources of protein are low in saturated fat and thus have an advantage over protein obtained from meats. Thus a vegetarian meal that is well balanced can be as nutritious, if not more, than a non-vegetarian meal.